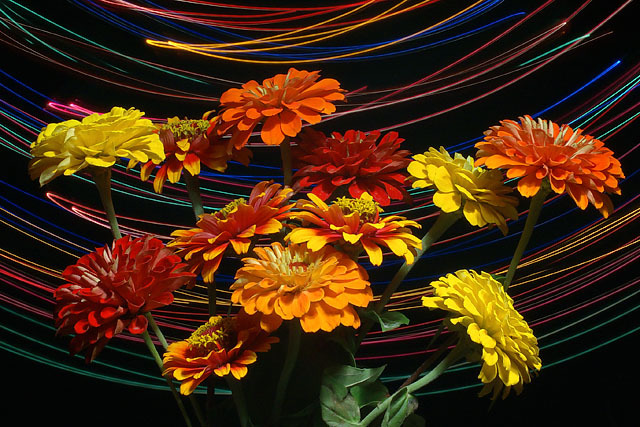 Judging by past reactions to entries my using light motion around a flower(s), I should not have bothered. I entered one, Light Motion Still Life in the Motion Blur Challenge in March '04 . It got a 5.15. The second was recently, Galactica in the Painting with Light III Challenge, June '07. It got a 5.54. An improvement. Figuring that this one is actually better than the other two and hoping it might fit this challenge better, I'm thinking a finish just below 6.0. So thank you in advance. I could use a 6.0 or better...I'm beginning to forget what that is like. LOL! Post: Convert from raw in PSElements 3.0 with a +0.33 exposure compensation. Layer adjustments for levels, brightness/contrast and hue/saturation. Crop. Crop again for 1.50:1 aspect ratio. The crops were to get a bit of off white streaks out of the top of the image that I did not like. Sharpen. Resize. Shapen. Wow, this is so colorful! Awesome picture! Is this a Robert Mann ( banmorn) photo? Good job. Nicely exposed flowers with a colourful backgroung combinr to make this an excellent interpretation of the theme. There is a lot to look at and so it retains my gaze. That yellow streak crossover grabs too much attention but otherwise the streaks add to the shot. I enjoy this one v. much. The flowers are very nicely crisp. Great composition... the colors are all popping. very nice and colorful. flowers are centered nicely. Proudly hosted by Sargasso Networks. Current Server Time: 04/18/2019 04:43:15 PM EDT.